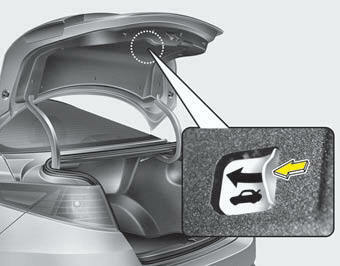 Your vehicle is equipped with an emergency trunk release lever located inside the trunk. If someone is inadvertently locked in the trunk, moving the handle in the direction of the arrow will release the trunk latch mechanism and open the trunk. No one should be allowed to occupy the trunk at any time. The trunk is a very dangerous location in the event of a crash.